and do not necessarily reflect the views of the National Science Foundation (NSF). The Angelo Coast Range Reserve is a component of the University of California Natural Reserve System (NRS), and is managed by UC Berkeley (UCB). 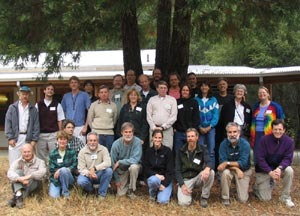 The National Science Foundation sponsored a planning workshop for the Angelo Reserve, held on site, near Branscomb, California, on September 5-7, 2003. The participants included twelve scientists from outside the University of California, listed in Appendix 1. Of these, five were affiliated with universities outside of California, one was with a nonprofit ecological research institute (the Institute of Ecosystem Studies), four were affiliated with federal research agencies (USGS, Oak Ridge National Laboratory, and the USDA-USFS) and one scientist worked for a private environmental consulting firm. Also in attendance were the Director of the Hastings Natural History Reservation (also in the NRS), and seven faculty from three departments at UCB, one of whom was the campus Vice Chancellor for Research, and another the Director of the UC Systemwide NRS. Following a general orientation to the site, guided field trips demonstrating ongoing research projects, and a day and a half of discussion, the review committee reached several recommendations. Inclusion of the whole watersheds of seven small streams, and of reaches of larger river channels, spanning catchment areas of < 1 to 260 km2. Meteorological and stream runoff monitoring data, including a 36 year record from Elder Creek, as a USGS Benchmark Station. Twenty-five years of research on biological, ecological, geomorphological, and human cultural aspects of the Angelo Reserve ecosystem. A new partnership with Earth Scientists at the NSF STC, the National Center for Earth Surface Dynamics, and strong potential for partnerships and collaborations with scientists from the USGS and USFS currently engaged in other studies in the Pacific North Coast region. A favorable location with relatively simple underlying geology and no major upwind sources of urban or agricultural pollution, facilitating the study of atmospheric inputs from the Pacific Ocean. Cross-habitat linkages between channel and terrestrial food webs and ecosystems. Use of remote and automated sensing devices to monitor ecologically-relevant environmental conditions and corresponding habitat use and movements of organisms. Salmonid population dynamics in fluctuating, heterogeneous environments. Feedback from organisms and climate to the physical and chemical forcers of landscape evolution. The Angelo Coast Range Reserve is one of 34 sites in the University of California Natural Reserve System. The Reserve encompasses about 3000 hectares of steep, dissected landscape, one of the largest tracts of coastal Douglas fir-Coast Redwood forest remaining in the state of California, a 5 km reach of the South Fork of the Eel River, and the entire watersheds of three of its perennial tributaries. Research at the Reserve began under The Nature Conservancy of California in the 1970s, and has continued after administrative transfer to the University of California, Berkeley and the UCNRS in 1994. A gift from the Richard and Rhoda Goldman Fund allowed the construction of a new Environmental Center, including a meeting room, simple laboratories, and a screened lathe house completed during the summer of 2002. In addition, a rudimentary canopy access facility was constructed along a river-to-ridge elevational gradient. These new facilities can support an expansion and deepening of the contribution of the Angelo Reserve to our understanding of the California North Coast region, as well as broad scientific questions about organismal, ecosystem and landscape change. 1. What new questions could or should be addressed at the Angelo Reserve that have not yet been addressed? What promising new research directions could be well-served by this Reserve? 2. What other research programs are studying environmental change in rivers and watersheds along the California North Coast? How might changes over the larger region influence the future of Angelo Reserve ecosystems? How might the Angelo Reserve participate in coordinated regional studies to expand the spatial extent of our knowledge of landscape-ecosystem-organism interactions? 3. Can one defend a long-term commitment to monitoring at the Angelo Reserve? What variables would be most valuable to monitor? What emerging technologies are available to support monitoring? Who might fund or support such efforts? What are successful models from other institutions or programs? 4. Informatics: How does data sharing and archiving work now, and how it should work in the future? 5. What other infrastructure (buildings, equipment, monitoring technology) is needed for the Angelo Reserve to fulfill its promise as a center for University and collaborative research, teaching, and outreach? The first three question topics were merged during the lively day and a half discussion, and our report below combines participants’ thoughts on all three questions under each of the following four research directions that were highlighted as promising avenues for future collaborative research programs at the Angelo Reserve. Following this, we describe the facilities and other infrastructure needed to support these programs. 1. Feedback from organisms and climate to the physical and chemical forcers of landscape evolution. A long-term context for such research is provided by discharge, temperature and water quality records from the USGS gaging station on Elder Creek, continuously monitored from 1967 to the present. The Elder Creek station is a Benchmark Hydrological Station, one of 57 operated throughout the United States by the USGS. As such, participant Carol Kendall told us that it qualifies for support from the USGS Water, Energy, and Biogeochemical Budget, for example, water chemistry analyses of collected samples. Gaging records from the USGS station on the South Fork Eel River at the south end of the Reserve are available from 1968 to 1996. With NSF research funding, the station was reactivated after 1990, and monitoring of standard meteorological variables was added. Sampling sites are available within or near the reserve that range in catchment area from < 1 km2 to 260 km2, enabling study of downstream and basin related changes in physical, chemical, and biological variables linking landscapes and biota. The relatively simple geology underlying the Reserve (sandstones and mudstones are the only two common rock types) facilitates basin-level comparisons of the influence of other drivers like slope, drainage area, aspect, and local micro-climate. The regional setting of the Reserve in the North Pacific Coast positions it for studies potential impacts over the next decades of factors such as the anticipated change in atmospheric inputs from China. The Mediterranean climate and the lack of snow pack storage in the basin simplify studies linking climate, hydrology, and landscape and ecosystem dynamics. They also potentially make the site representative of landscapes anticipated to respond sensitively to climate and land use change. The only other site in the North Pacific Coast region with intensive biogeochemical studies is the H.J. Andrews Experimental forest in Oregon, much further inland than the Angelo Reserve. 2. Cross-habitat linkages between channel and terrestrial food webs and ecosystems. A number of participants identified study of ecosystem and ecological interactions across habitat boundaries as a key area for future research (Polis et al. 2004, Turner 1989, Cadenasso et al. 2003, Lovett et al. 2004) with two boundaries identified as key foci for future research: the interface between river channels and terrestrial watersheds, and that between the forest canopy and the atmosphere. The Angelo Reserve offers exceptional opportunities to study ecological, biophysical, and biogeochemical processes that mediate fluxes across both boundaries. These fluxes combine to exert major control on forest and river ecosystems and landscape evolution. Previous research at the Angelo Reserve (Sabo and Power 2002a,b, Power et al. 2004, Power and Rainey 2000) has addressed how upslope export of river production (of algae or emerging aquatic insects) influences a variety of terrestrial consumers in adjacent watersheds, from riparian zones upslope to drainage divides. The indirect food web and ecosystem consequences of these fluxes remain largely unknown. In addition, the reciprocal forest-to-river linkages are more poorly understood at the Reserve, particularly as these relate to hydrologic flow paths and their influence on sediment, nutrient and carbon budgets in the watershed. The representation on site of many sub-basins with different drainage areas greatly enhances the Reserve’s ability to support studies of how factors that change systematically down drainage networks (edge:area ratios; drainage area, slope dependent controls) affect these interactions. Several participants expressed keen support for, and interest in initiating hydrologic monitoring to begin to fill this gap in our understanding of Angelo watershed dynamics. Atmospheric inputs to the Reserve of precipitation and airborne chemicals are intercepted and altered by the extensive forest canopy over the Angelo Reserve in as yet unknown ways. The canopy walkway facility (the first and so far the only to be built in a forest with old growth redwoods) provides access for researchers to the fascinating and ecologically important habitat boundary between the atmosphere and the forest canopy. Participant Todd Dawson briefly described his research program on the interactions of redwoods and coastal fogs. This research documents mechanisms of atmosphere-canopy interactions that can strongly influence the health of redwood trees and forests. Prof. Dawson related the leap forward that his program has recently taken due to collaboration with Prof. David Cullar, Director of the Intel Laboratory at U.C. Berkeley, an expert in wireless networks of small sensors that are beginning to revolutionize our ability to detect micro-climatic and biological changes at scales relevant to organisms in nature (see discussion of Critical Needs for Infrastructure below). The Angelo Reserve would be an interesting site for Dawson’s program because it represents redwoods at an inland extreme of their range, where they are stressed by low fog inputs. Inputs of fog and other sources of moisture to the site are anticipated to change during long-term climate change. Monitoring of these variables and their effect on ground water and channel hydrology and chemistry would also be invaluable should fire or Sudden Oak Death cause large scale changes in forest cover of basins within the Angelo Reserve, as little is known about the impact of either event on these key ecosystem properties. In the absence of such a large scale disturbance, monitoring of these variables would still be very informative, as changes in the composition of the diverse forest stands at the Angelo Reserve, which include upslope mixed deciduous forests, would document the consequences of forest conversion to Douglas fir dominated assemblages under the current regime of fire suppression (Hunter and Barbour 2002). Needless to say, hypotheses about the effects of forest stand conversion (e.g. from deciduous to conifer species) on variables like ground and surface water chemistry would strongly motivate long term monitoring of key variables. Long term monitoring at the Angelo Reserve should become increasingly feasible as technology for remote sensing and automated monitoring improves, and becomes more affordable. 3. Use of remote and automated sensing devices to monitor ecologically-relevant environmental conditions and corresponding habitat use and movements of organisms. Several participants who had studied landscape scales (including Drs. Strayer, Stewart, Kirchner, Kendall, Dietrich, Welter and Hastings Reserve Director Dr. Mark Stromberg) strongly suggested that remote sensing images (e.g. from AVHRR satellites) be used to supplement the airborne laser altimetry images (LIDAR) already provided to the Angelo Reserve by Prof. Dietrich at UCB. Periodically collected satellite and LIDAR images would greatly facilitate monitoring changes in forest composition, productivity, and health over the rugged terrain of the Reserve. In addition, several participants (Drs. Dawson, Lisle, Welter, Schade) related their own experiences with newly available ground-based sensor technology and automatic sample collection in their process studies and long-term environmental monitoring programs. They advocated the implementation of such technology to support research at the Angelo Reserve. The USFS Redwood Sciences Laboratory in Arcata CA has developed cutting edge technology for automatic sampling of suspended sediment, a variable of central importance in relating land use (forest practices, roads) to sediment loading, channel habitat condition, and ultimately, the capacity of these watersheds to sustain salmonid populations (Tom Lisle, personal communication). Drs. Lisle and Harvey, researchers in hydrology and aquatic ecology, respectively, at the USFS Redwood Sciences Laboratory, expressed strong interest in adding sites for their studies at the Angelo Reserve to generate heuristic comparisons with their ongoing studies in other regional watersheds. For example, sediment yields from watersheds representing a gradient of land use intensity could be compared using Angelo in combination with the Caspar Creek Experimental Watershed (on the west side of the Coast Range in Mendocino Co., CA), and Bull Creek, a heavily logged watershed in the South Fork Eel drainage of similar size to Elder Creek. Comparisons between the Angelo Reserve, on the landward east side of the Coast Range, and Caspar Creek, on the west side of the Coast Range, would allow us to examine the effect of oceanic influence on variables like fog inputs, through fall water chemistry and ground water and runoff isotopic signatures. These are variables that influence stable carbon and nitrogen isotopes that have been used at the Angelo Reserve to study the spatial scales of trophic interactions in river food webs that support salmonids (e.g. Finlay et al. 2002). 4. Dynamics of species of critical concern, including salmonids, in fluctuating and heterogeneous environments. The Angelo Reserve has, can and should contribute to our knowledge of factors affecting species of special concern in the region, such as salmonids, foot-hill yellow legged frogs, Townsend’s long-eared bat, and spotted owls. The canopy facility presents an exciting opportunity to develop tools for monitoring species like birds and bats acoustically. Some of the spawning streams are narrow and clear enough to permit optical monitoring of returning salmonid spawners. These data are quite limiting in general for salmon biologists, and annual population return information from the Reserve would be of great value to biologists trying to assess and understand trends in salmonid populations along the Pacific coast. The Angelo Reserve has a special opportunity to contribute to regional studies of salmonid population dynamics. Its steep, erosion prone coastal forests include large areas that have not been degraded by logging or roads, and thus offer baseline representation of natural levels of fine sediment yields to channels, a primary variable linking land use in watersheds to salmonid habitat and performance in channels. Biologists and earth scientists presently working on related issues in the region should be made more aware of this opportunity, and collaborations should be fostered. Bull Creek, mentioned above, has been a site for Dr. Harvey’s studies of how high sediment loading influences salmonid habitat use, feeding, and population dynamics. It represents an extreme contrast with the nearly pristine Elder Creek in the Angelo Reserve, but is similar in other important aspects (e.g. slope, drainage area, general regional climate.) Research on salmonids at the Angelo Reserve to date has been restricted to short term (e.g. 1-2 month long) studies during the summer low flow season of how juvenile salmonids influence food webs in river pools, or how they respond to various amounts of fine deposited sediments in the river bed. Longer-term, larger scale studies would be needed to probe factors influencing their life histories and population dynamics in this system. However, recent advances in isotopic and trace element analysis of otoliths (underway at Berkeley in the in the laboratory of Drs. Peter Weber and Lynn Ingrahm), combined with efforts by Dr. Bret Harvey to calibrate and validate Individual Based Models for salmonids in Bull Creek, could expand our understanding of Angelo salmonid population dynamics and contribute to our understanding of regional changes in freshwater habitat that underlie the alarming declines in salmon populations along the Pacific North Coast. Present assets of the Reserve include a $1.2 M Environmental Science Center, gifted by the Goldman Fund and completed in summer 2002. This complex includes laboratory, computer, library, and meeting spaces that have been used for several workshops (including this one) and multi-university scientific collaborations, and support both extremely well. The potential of this new facility to support outstanding new research for the 21st century at the Angelo Reserve, however, is still severely limited by the lack of suitable housing for vistiting investigators at the Reserve. In addition, other infrastructure to support data storage and dissemination, real time communications, equipment storage, and environmental monitoring are needed. These critical infrastructural needs are detailed below. At present, funding from the National Center for Earth Surface Dynamics supports internet satellite connectivity at the new Environmental Science Complex built by the Goldman Fund (Power et al. 2003 (see Management Plan)). Efficient communications between remote sites on the Reserve and central headquarters are still lacking, however, and are essential, both in case of emergency, and to serve as a communications backbone for the real-time environmental monitoring envisioned for future research. Several participants suggested that small All Terrain Vehicles would greatly facilitate transport of researchers, particularly those carrying heavy equipment, to remote sites on the reserve. These vehicles, and a stable of non-motorized mountain bicycles available for visitors to borrow and use on the roads would also reduce wear and tear on the single road by reducing automobile traffic. (The problems of maintaining roads in steep erodable terrain makes reducing vehicular traffic particularly desirable). At high flow, the South Fork Eel cannot be waded, precluding access to the western third of the Reserve. An aquatic sampling platform over the river would provide this access during the winter, and would also facilitate taking photographs of channel habitats as well as biological, and geological (e.g. suspended sediment) samples during high flow. This sampling platform would greatly enhance the ability of earth scientists to understand the evolution of channel form in bedrock rivers by allowing measurements as yet unavailable for gravel transport during high flow (W.E. Dietrich, personal communication). While this type of river is extremely common, the geomorphic processes governing the evolution of its form are not yet well understood. Funds from the Goldman gift were not sufficient to complete the canopy access facility. The committee agreed that the value of the facility for 3-dimensional forest sampling, and for studying the probably critical function of canopy gaps in the forest, would be enhanced by simple cable and pulley systems that could allow cameras and environmental monitoring and sampling devices to be deployed at various distances above the forest floor in upstream or downstream directions from each tree, perpendicular to the present river-to-ridge cross valley transect. The safety of the canopy is ensured by annual inspections of the Arbornaut Access team that built it, and modest recurring funds are needed to cover the fee for their inspections. Workshop participant Todd Dawson described his collaboration with researchers at U.C. Berkeley who are PIs in CENS, the Center for Embedded Network Sensing (a 2002 NSF STC Center). These researchers are pioneering the development of wireless networks of environmental sensing devices. New and ongoing programs at the Angelo Reserve (e.g. monitoring and experimental studies of animal activity, plant physiology, and microenvironments and ecosystem productivity in channels or forest canopies) would benefit greatly from the deployment of these new wireless devices. Collaborations between CENS and NCED have been encouraged by NSF, and are being pursued by both STC Directors and by NCED Co-PI Mary Power. The use by NCED of Angelo as a primary field laboratory increases our chance of collaborating with CENS PIs at the site. In addition, automated sample collections for analyses of stream water chemistry and suspended sediment from 6-8 different stream drainages within the reserve would support ongoing research (e.g. Power and Dietrich 2002, Finlay 2001) and future studies of ecology, ecosystem metabolism, hydrology, biogeochemistry and sediment transport in watersheds of varying drainage areas. Cutting edge technology for this purpose has been developed and used by scientists at the Redwood Sciences Laboratory. Automatic samplers of stream runoff and suspended sediment also underpinned studies by two workshop participants (Welter and Schade) of Arizona desert watersheds. These researchers would make use of such devices for comparative work at the Angelo Reserve. Participants also recommended the periodic purchase of satellite (e.g. AVHRR) and LIDAR imagery to track large-scale changes in forest biomass, composition, and health, as well as more general changes in land cover, in light of anticipated changes in all these variables due to disease (e.g. sudden oak death), climate change, forest type conversion due to fire suppression, or large scale disturbances from major floods, fires or landslides. An acute housing shortage at the Reserve limits its ability to host workshops. The nearest comfortable motels are about an hour's drive over a winding logging road. There is no housing available on site suitable for senior researchers, particularly those who might wish to bring their families for extended periods of research. The Reserve needs two to four small apartments for the latter type of user, and a second building with single bedrooms and shared living, cooking and bathrooms suitable for housing about 10-12 students or workshop or conference attendees. These new buildings should be on the south border of the Reserve, near the new Environmental Science Center. As a further incentive for faculty or agency PIs, the Angelo Reserve needs to provide secure storage for investigator’s private equipment and samples. Such storage would provide the convenience to researchers of not being limited by what they can carry in their cars, and would also facilitate keeping the common scientific space uncluttered. Inexpensive storage for this purpose could be created from modified shipping containers. A recharge system could defray expenses, and would also discourage long-term storage of less than critical samples or gear at the Reserve. Field scientists commonly need to invent and fabricate gear on site. An upgraded shop facility would support this need, and improve the efficiency and safety of researchers using it. The Angelo Reserve has old garage space that would be suitable for conversion to a shop. The laboratory also is in need of a water purification system to support the expanded water chemistry analyses planned for the future. In addition, augmentation of dissecting and compound microscopes, vacuum pumps, balances, centrifuges, and other equipment commonly required by researchers at the reserve would better equip the laboratory facility to serve future needs. Workshop participants recommended that the Angelo Reserve follow guidelines in a national framework for data collection and management that was recently articulated by the Organization of Biological Field Stations. The OBFS Operations Manual for field stations outlines the need to establish an Internet-based network for data sharing and archiving among Biological Field Stations. Structure and guidelines for data sharing have built on collaborations among 160 OBFS member stations, Long Term Ecological Research (LTER) sites, and the National Center for Ecological Analysis and Synthesis (NCEAS) and the San Diego Supercomputing Center (SDSCS). Protocols and standards for data management and sharing through the development of an OBFS network were proposed in order to answer questions about the condition of strategic natural resources nationwide, and to contribute to the development of more informed land use and environmental policies (Stanford and McKee 2000). The Angelo Reserve should make use of these guidelines as they develop database and information management techniques to compile, store and disseminate the swelling tide of information that will be gathered by researchers, automated environmental and biological monitoring, as well as from the anticipated spatial data from LIDAR, AVHRR, GPS, and other technologies used to map and monitor environments. Human resources are clearly a limiting factor for this large endeavor. Workshop participants with experience in long-term ecological research (Strayer, at Hubbard Brook and IES, and Welter and Schade, at the Arizona Urban LTER and Sycamore Creek) strongly urged Angelo researchers and managers to apply for supplementary funding such as NSF LTREB (Long Term Research in Environmental Biology) grants to support salaries of technicians who could oversee monitoring programs and assist with database management. In addition, some funding from the NSF NCED STC should be applied to this critical infrastructural need at the Angelo Reserve. Cadenasso, M. L., S. T. A. Pickett, K. C. Weathers, S. S. Bell, T. L. Benning, M. M. Carreiro, and T. E. Dawson. 2003. An interdisciplinary and synthetic approach to ecological boundaries. BioScience 53:717-729. Grimm, N.B., S. E. Gergel, W.H. McDowell, E.W. Boyer, C.L. Dent, P.M. Groffman, S.C. Hart, J.W. perspectives of nutrient biogeochemistry. Oecologia: in press. research perspective. Hydrological Sciences 47: 811-821. Turner, M. F. 1989. Landscape ecology: the effect of pattern on process. ARES 20:171-197. My research focuses on factors affecting the dynamics of animal populations. In particular, I am interested in how stage-specific processes, life-history traits and behaviors of individuals translate into effects on dynamics at the population level. My approach is to combine predictions from theoretical models with laboratory or field observations and experiments. I am especially interested in how population dynamics theory can be applied to species interactions in host-parasitoid or host-pathogen systems. I have worked on a range of different systems, including the biological control of California red scale by its parasitoid, Aphytis melinus, the interaction among the autoparasitoids of whitefly, and the impact of disease on insect population dynamics. Murdoch, W. W., C. J. Briggs, and R. M. Nisbet. 2003 Consumer-Resource Dynamics. Monographs in Population Biology. Princeton University Press. Murdoch, W. W. and C. J. Briggs. 2002. Spatial dynamics of measles epidemics. Trends in Ecology & Evolution.17(9):399-401. Murdoch, W. W., B. E. Kendall, R. M. Nisbet, C. J. Briggs, E. McCauley, and R. Bolser. 2002. Single-species models for many species food webs. Nature. 417(6888): 541-543. NRS publications and video productions focus on making people aware of the research and teaching that goes on at U.C. Natural Reserve System. As the writer for Transect, the NRS's regular publication, my job is to uncover interesting stories and convey them in a way that engages and informs a wide audience, from U.C. administrators to the general public. Our lab is investigating the roles of cytoskeletal motors in motile events critical to the morphogenesis and survival of vertebrate retinal photoreceptors, and thus to human vision. We are interested in how these motors are deployed and how they power morphogenetic events and photomembrane turnover. Research in my laboratory focuses on the interface between plants and their environment. The tools of physiological and evolutionary plant ecology are currently being applied towards the study and interpretation of this interface. Investigations draw upon a variety of physiological methods, modeling and the use of stable isotopes as avenues for improving our understanding of how the ecophysiological characteristics of plants are shaped by and respond to the environments they inhabit. Projects done in my laboratory pay special attention to how aspects of plant form and function combine to permit adaptation to environmental variation, whether naturally or anthropogenically imposed, and how plants and their unique traits influence the structure and function of the communities and ecosystems they compose. Gregg, J.W., C.G. Jones, and T.E. Dawson. 2003. Urbanization effects on tree growth in the vicinity of New York City. Nature 424:183-187. Dawson, T.E, S. Mambelli, A.H. Plamboeck, P.H. Templer and K.P. Tu. 2002. Stable Isotopes in Plant Ecology. Annual Review of Ecology and Systematics 33:507-559. Traw, B.M. and T.E. Dawson (2002). Differential induction of trichomes by three herbivores of black mustard. Oecologia 131: 526-532. Our research projects share a common theme: we are seeking mechanistic, quantitative understanding of the form and evolution of landscapes. In addition, we are seeking linkages between ecological and geomorphic processes, as well as building tools to tackle pressing environmental problems. Our approach is to use field work, laboratory experiments, and numerical modeling to quantify and explore geomorphic processes. One result of these combined approaches has been the development of "geomorphic transport laws" that can be field-calibrated and used in both landscape evolution modeling and in practical applications. We have used high resolution laser altimetry to create detailed topographic maps and cosmogenic nuclide analysis to obtain estimates of rates of processes and to quantify transport laws. Numerical modeling work is underway to exploit both the high resolution topography and rate measurements to explore controls on landscape morphology. Roering, J.J., J. W. Kirchner, and W. E. Dietrich, 2001, Hillslope evolution by nonlinear, slope-dependent transport: Steady state morphology and equilibrium adjustment timescales, Jour. Geophys. Res. V. 106, No. B8, P. 16,499 - 16514. Professor of the Graduate School of Biochemistry & Molecular Biology at the University of California Berkeley. Director, UC Natural Reserve System. We are interested in the biosynthesis, structure, function, and assembly of phycobiliproteins, the light-harvesting proteins of cyanobacteria , red algae, and the cryptomonads, and in the design and applications of a wide variety of fluorescent probes. We have recently reconstituted the entire pathway for the synthesis of a fluorescent holophycobiliprotein subunit from a cyanobacterium in Escherichia coli. These experiments demonstrate the feasibility of generating constructs of these proteins in situ for use as fluorescent protein probes in living cells. We are also collaborating on computational approaches to the identification of important sites in protein sequences with Professors Bickel and Spector in the Department of Statistics. I am most interested in linking population and ecosystem processes in streams to answer the following questions: How do organisms affect ecosystem properties? How do changes in ecosystem function affect the composition and dynamics of populations? I am maintaining research on two broad fronts: biogeochemistry of nutrients and food web studies. Food webs allow interspecific interactions, such as predation, to be expressed in units of element flow, thus combining attributes of both population and ecosystem approaches. Studies of nutrient biogeochemistry allow understanding of functions unique to streams: How far are nutrients transported downstream, and what controls this distance? What is the role of stream channel processes in nutrient loss from a watershed? Stream biota may influence nutrient cycling and transport, e.g. snails can excrete nitrogen at rates nearly equal to demand by autotrophs. Hall, R. O. and J. L. Tank. 2003. Ecosystem metabolism controls nitrogen uptake in streams in Grand Teton National Park, Wyoming. Limnology and Oceanography 48:1120-1128. Bernhardt, E. S., R. O. Hall, and G. E. Likens. 2002. Whole-system estimates of nitrification and nitrate uptake in streams at the Hubbard Brook Experimental Forest. Ecosystems 5:419-430. Paul, M. J. and R. O. Hall. 2002. Particle transport and transient storage along a stream gradient in the Hubbard Brook Experimental Forest. Journal of the North American Benthological Society 21:195-205. Harvey, B. C., and R. J. Nakamoto. 1996. Effects of steelhead density on growth of coho salmon in a small California coastal stream. Transactions of the American Fisheries Society 125:237-243. Plant ecology, systematics, and physiology; importance of canopy gaps vs through-growth as mechanisms of change for forest composition; tree physiological traits and their significance for long term dynamics of mixed evergreen deciduous forests. Hunter, J.C. and M.G. Barbour. 2001. Through-growth by Pseudotsuga menziesii: A mechanism for change in forest composition without canopy gaps. J. Vegetation Science 12: 445-452. Hunter, J.C. 1997. Fourteen years of change in two old-growth Pseudotsuga-Lithocarpus forests in northern California. J. Torrey Botanical Society 124: 273-279. Hunter, J.C. 1997. Correspondence of environmental tolerances with leaf an branch attributes for six co-occurring species of broadleaf evergreen trees in northern California. Trees 11: 169-175. Chief of the Isotope Tracers Project, USGS Menlo Park Stable Isotope and Tritium Labs. Carol's main field of interest is watershed biogeohydrochemistry. Other interests include: the impact of isotopic fractionations and heterogeneity in shallow hydrologic systems on determination of water and solute sources; the development of an isotope database of meteoric-derived waters in North America; nitrate sources and cycling; the use of biota isotopes as indicators of nutrient sources, landuses, and redox reactions; and the development of new analytical methods and practical applications for CHNOS stable isotopes. Feng, X., J.W. Kirchner, and C. Neal, Spectral analysis of chemical time series from long-term catchment monitoring studies: hydrochemical insights and data requirements, in press, Water, Air, and Soil Pollution. Kirchner, J.W., A double paradox in catchment hydrology and geochemistry, Hydrological Processes, 17, 871-874, 2003. Kirchner, J.W., The Gaia Hypothesis: conjectures and refutations, Climatic Change, 58, 21-45, 2003. Research Interests: Fluvial geomorphology; Relation of watershed processes to aquatic and riparian ecosystems Research Objectives:To gain a better understanding of the physical and biological processes that integrate terrestrial, riparian, and aquatic ecosystems at the watershed scale. To take an interdisciplinary approach to study the production and transport of watershed products (water, sediment, woody debris, nutrients, and heat) and their influence on physical and biological resources (such as water supply and fish populations). Using this improved understanding, to assist in the development of new management strategies for ecoscape management. Dewey, Nicholas J., Thomas E. Lisle, and Leslie M. Reid. 2002. Gully development in tributaries to Caspar Creek, Northern California Coast Range. Eos, Transactions American Geophysical Union 83(47): F532. Smith, Bonnie J., Thomas E. Lisle, Diane G. Sutherland, Sue Hilton, Harvey M. Kelsey, and Eileen M. Cashman. 2002. Interactions between sediment storage and bed material transport: A field and flume study. Eos, Transactions American Geophysical Union 83(47): F532. Research Emphasis: Landscape ecology; Plant and wildlife ecology in natural compared to human-impacted systems. Current Research Projects in Progress: historic range of variability of vegetation in national forests; spatially-explicit metapopulation model of the marbled murrelet. 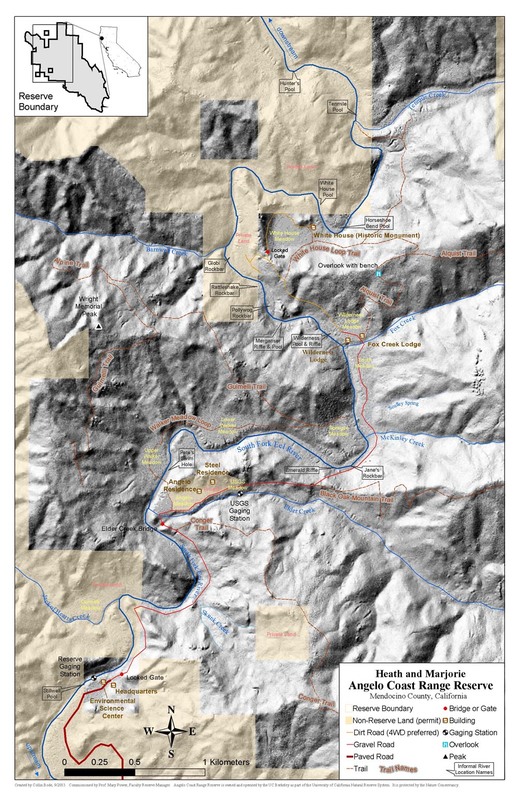 ; reconstruction of historic vegetation using dendrochronology on Libby Flats, Wyoming; changes in resources and ecosystems that led to the demise of the Anasazi; spatial and temporal variation in nutrient transport from sea to land by coastal river otters. Meyer, C.B., S.L. Miller, and C.J. Ralph. 2002. Multi-scale landscape and seascape patterns associated with marbled murrelet nesting areas on the U.S. West Coast. Landscape Ecology 17(2):95-115. Meyer, C.B., and S.L. Miller. 2002. Marbled murrelet use of fragmented landscapes in southern Oregon. Conservation Biology 16(3):755-766. Miller, S.L., C.B. Meyer, and C.J. Ralph. 2002. Landscape and seascape patterns associated with marbled murrelet abundance offshore. Waterbirds 25(1):100-108. My research focuses on streams and rivers primarily, with emphasis in two broad areas: (1) understanding ecological consequences of human disturbance and (2) conservation of aquatic biodiversity. Recent projects include unravelling the effects of dams and flow regulation on energy pathways through river food webs and evaluating alternatives to herbicides for control of invasive aquatic vegetation in irrigation canals with connections to salmon-bearing streams. My ongoing research includes (1) an investigation of the distribution and effects of non-native higher aquatic plants on river systems in southwestern Oregon and the role of dams and flow regulation in mediating these effects; (2) a biogeographic analysis of amphibian distribution in the Klamath-Siskiyou ecoregion, focused specifically on the recently designated Cascade-Siskiyou National Landscape Monument, and (3) restoration of thermal spring systems in Ash Meadows National Wildlife Refuge and an investigation of factors controlling reproductive success in the Devils Hole pupfish. Parker, M. S., M. E. Power, and J. T. Wootton. 2002. Effects of substrate composition, streambed stability, and sediment supply on survival and trophic role of a dominant stream grazer. Verh. Int. Verein. Limnol. 28: 238-241. Parker, M. S. 2002. Aquatic environments and associated fauna. Pp. In D. C. Odion and E. J. Frost (eds.). Protecting Objects of Scientific Interest in the Cascade-Siskiyou National Monument: Status, Threats, and Management Recommendations. World Wildlife Fund, Ashland, OR. Sytsma, M. D. and M. S. Parker. 1999. Aquatic vegetation in irrigation canals: a guide to integrated management. Oregon Center for Lakes and Reservoirs, Portland State University. 51 pp. Our lab group investigates food webs in rivers and their watersheds. We are interested in how attributes of species influence their effects in food webs, and how species interactions change under different environmental regimes. My group investigates the interplay of trophic dynamics with hydrologic and productivity regimes in northern California rivers and meadows. We also study impacts of invading alien species, and linkages between rivers and their watersheds. For several years, we have studied the influence of river-derived insect production on terrestrial consumers in watersheds (spiders, lizards, bats). We are beginning studies of effects of fine bed sediments on juvenile steelhead and the food webs that support their growth. Sabo, J.L., M.E. Power. 2002. Numerical response of lizards to aquatic insects and short-term consequences for terrestrial prey. Ecology, 83(11), 2002, pp. 3023–3036. Finlay, J.C., Khandwala, S. and M.E. Power. 2002. Spatial scales of energy flow in food webs of the South Fork Eel River. Ecology 83: 1845-1859. Power, M.E. and W.E. Dietrich. 2002. Food webs in river networks. Ecological Research 17:451-471. My specific research interests concern interactions between hydrology, biogeochemical cycles and food webs, and encompass the following questions: 1) How do stoichiometric relationships between plants, soils, microbes and herbivores link biogeochemical cycles to population and evolutionary ecology? 2) How does spatial and temporal variation in hydrologic exchange between landscape elements influence biogeochemical cycling? 3) how do interactions between carbon, nitrogen, and phosphorous cycling influence ecosystem structure and function? The answers to these questions will be heavily influenced by the effects of human activities, particularly disruptions of carbon and nitrogen cycles, and changes in hydrological processes and precipitation regimes. Schade, J.D., S. Collins, R. Sponseller, and A. Stiles. 2003. The influence of Mesquite on understory vegetation: effects of landscape position. Journal of Vegetation Science 14: 743-750. Schade, J.D., M. Kyle, W.F. Fagan, and J.J. Elser. 2003. Stoichiometric tracking of soil nutrients by a desert insect herbivore. Ecology Letters 6: 96-101. Schade, J.D., S.G. Fisher, N.B. Grimm, and J.A. Seddon. 2001. The influence of a riparian shrub on nitrogen cycling in a Sonoran Desert stream. Ecology 82: 3363-3376. My research interests are demonstrably eclectic, but usually aquatic or botanical, and almost always empirical, as evidenced from my publications. I have a special fondness for research that helps me understand key functional processes of ecology, particularly those that occur at interfaces between various types of things and between subject-matter areas -- chemistry and biology, biology and physics, land and water, etc. Stewart, A.J. 2000. A simple stream monitoring technique based on measurements of semi-conservative properties of water. Environmental Management (In press). Stewart, A.J. and B.K. Konetsky. 1998. Life-cycle testing of receiving waters with Ceriodaphnia dubia. Environmental Toxicology and Chemistry 17:1165-1171. Napolitano, G.E., J.E. Richmond and A.J. Stewart. 1998. Characterization of petroleum-contaminated soils by thin-layer chromatography with flame ionization detection. Journal of Soil Contamination 7:709-724. Dr. Strayer's research is focused on the distribution and roles of freshwater invertebrates. He is currently working on the ecology of the Hudson River and on understanding the controls on distribution and abundance of pearly mussels. He is co-author of The Pearly Mussels of New York State, a comprehensive book on Unionids, a diverse and endangered group of animals. Strayer, D.L., H. Ewing, and S. Bigelow. 2003. What kind of spatial and temporal details are required in models of heterogeneous systems? OIKOS 102: 654–662. Strayer, D.L., K. Hattala, and A. Kahnle. 2003. Effects of an invasive bivalve (Dreissena polymorpha) on fish populations in the Hudson River estuary. Ecological Applications. Submitted. Strayer, D.L., and D.R. Smith. 2003. A guide to sampling freshwater mussel populations. American Fisheries Society. In press. Growing up on the desert grasslands of the Sandia foothills in Albuquerque, New Mexico, I have had a life-long association of animals and plants of open prairies. My undergraduate training was in wildlife biology at Colorado State University, where I learned basics of plant ecology on the short-grass steppe of Pawnee Buttes and later the grasslands of southeastern Arizona. Later, I completed a Master’s degree in the Thunder Basin grasslands of eastern Wyoming and then a dissertation in the sand prairies of southern Wisconsin, as a member of the Zoology Department of the University of Wisconsin, Madison. I minored in botany. I have studied grasslands and the animals they support including swift foxes, prairie dogs, black-footed ferrets, Wyoming toad, and Montezuma Quail. Recently, I have described long-term patterns in California grasslands, and trying to understand the plant ecology of California coastal terrace grasslands as well as the ecology of other California grasslands. Stromberg, M. R., P. Kephart and Mardi Sicular-Mertens. 2002. Tillage: Cheap weed and gopher control before planting native grasses. Grasslands 12:1-7. Steenwerth, K. L., L. E. Jackson, F. J. Calder�n, M. R. Stromberg, and K. M. Scow. 2002. Soil microbial community composition and land use history in cultivated and grassland ecosystems of coastal California. Soil Biology and Biochemistry 34:1599-1611. Hamilton, J. G., J. R. Griffin, and M. R. Stromberg. 2002. Long-Term population dynamics of native Nassella bunchgrasses in unmanaged stands in central California. Madrono 49:274-284. The objective of my dissertation research is to determine how terrestrial and aquatic components of an arid land watershed are connected, and how their spatial arrangement influences nitrogen cycling. Specifically, I have been investigating the role of intricate networks of intermittent rivulets, gullies and larger tributaries in desert landscapes in connecting the terrestrial desert with larger streams during storms, and the implications of these interactions for nitrogen processing and retention. While focusing on nutrient cycling and biogeochemistry, I have explicitly considered 1) how hydrologic processes influence runoff patterns and horizontal nitrogen transport in arid-lands; 2) how patterns in rainfall and storm size, intensity, and frequency influence both horizontal and vertical patterns in microbial activity and processing of nitrogen; and 3) where nitrogen retention “hot spots” are located in the landscape and how they shift in space and time. Belnap, J., J.R. Welter, N.B. Grimm and N. Barger. 2003. Linkages between microbial and hydrologic processes in arid and semi-arid watersheds. In review. Ecology. Schade J.D., E. Marti, J.R. Welter, S.G. Fisher, and N.B. Grimm. 2002. Sources of N to the riparian zone of a desert stream: implications for riparian vegetation and nitrogen retention. Ecosystems 5:68-79. Fisher, S.G., J.R. Welter, J.D. Schade, and J.C. Henry. 2001. Landscape challenges to ecosystem thinking: creative flood and drought in the American Southwest. Scientia Marina 65 (suppl 2): 181-192. My research group has always been diverse. We pursue a range of projects and our personal histories are varied. We are united by a shared curiosity about how generalist arthropod predators interact with each other, with their prey, and with their enemies. Our interests run from basic to applied ecology and back; the distinctions are fuzzy. Our research sites have ranged from the forest floor to Mediterranean scrub to vegetable gardens. We have an inordinate fondness for spiders and beetles. We share a commitment to field experimentation to test ecological hypotheses, but we have also employed other approaches: behavioral experiments in the laboratory, multivariate analyses of field surveys, protein electrophoresis to identify prey in spider guts, stable isotope analysis, measurement of fungal biomass by assaying for ergosterol, meta-analyses of published studies, and an occasional foray into modeling. I don't know how my group will evolve in the future. The hypotheses, not a technique or approach, are central. Williams, J. L, and D. H. Wise. In press. Avoidance of wolf spiders (Araneae: Lycosidae) by striped cucumber beetles (Coleoptera: Chrysomelidae): laboratory and field studies. Environmental Entomology. Moya-Lara�o, J. J. M. Orta-Oca�a, J. A. Barrientos, C. Bach and D. H. Wise. In press. Intriguing compensation by adult female spiders for food limitation experienced as juveniles. Oikos. Moya-Lara�o, J., J. Pascual and D. H. Wise. In press. Mating patterns in late-maturing female Mediterranean tarantulas reflect the costs and benefits of sexual cannibalism. Animal Behaviour. Group convenes at Environmental Science Center. Welcome from Peter Steel (Reserve Manager) and Mary Power (Faculty Manager). Sign ups for guided field trips of forest, meadow, rock bar, and stream and channel biota and habitats (each participant can choose two different tours). Driving, hiking tour for overview of the Reserve: the Environmental Science Center facility; Headquarters, meteorological and gaging stations; drive to Elder Creek confluence, view mainstem South Fork Eel River at Elder Creek Confluence, then hike up to waterfall along Elder Creek; drive over divide returning to South Fork Eel watershed and see canopy access facility, McKinley Creek, and Jane’s riffle; drive by South Meadow and tour Blake Suttle’s climate change experiment; arrive at Fox Creek Lodge at 6 pm. Dinner at Wilderness Lodge. Informal campfire discussions. Vans/cars depart for coast lodges from Wilderness Lodge. Continental breakfast at the Environmental Science Center. Overview of the history of the Angelo Reserve, the evolution of Angelo-based research, and current opportunities and challenges. Discussion of goals for the workshop. Group Discussion – During these, we will ask some participants to relate their own experiences with long term monitoring programs or regional scale studies to the potential for such contributions at the Angelo Reserve. Group Photo, followed by lunch at Environmental Science Center. 4. Informatics: How data sharing and archiving works now, and how it should work in the future (Collin Bode, Mark Stromberg, OBFS and LTER models). Guided tours for interested participants of research projects at the reserve. Swimming or snorkeling in the river is an option (bring your own gear). Dinner at Wilderness Lodge, and campfire discussions. Vans depart for the coast. Continental breakfast at Environmental Science Center. Sunday 10 am –12 noon. General discussion to summarize suggestions about new initiatives and collaborations. Key points relevant to workshop report recorded. Final discussion of facilities and management planning at the reserve that would support of research directions proposed. Lunch at Environmental Science Center, free time. Writing committee (3 participants) drafts a 5-10 pp Workshop Report covering the five topics covered in our discussions. Other workshop participants disperse to further explore the Reserve or depart, as their schedules allow or require. Bastow, J. L., J. L. Sabo, J. C. Finlay, and M. E. Power. 2002. A basal aquatic-terrestrial trophic link in rivers: algal subsidies via shore-dwelling grasshoppers. Oecologia 131:261-268. Berlow, E.L., S.A. Navarrete, M.E. Power, B.A. Menge, and C. Briggs. 1999. Quantifying variation in the strengths of species interactions. Ecology 80: 2206-2224. Carpenter, S., T. Frost, L. Persson, M. Power and D. Soto. 1996. Freshwater ecosystems: Linkages of complexity and processes. pp. 299-325 in Mooney, H.A., Cushman, J.H., Sala O.E. and Schulze, E-D. (eds.) Functional Roles of Biodiversity: A Global Perspective. Wiley, N.Y.
Carpenter, S., T. Frost, L. Persson, M. Power, and D. Soto. 1995. Lakes and rivers. pp. 157-164 In H.A. Mooney and J. Lubchenco. SCOPE Global Biodiversity Assessment, UNEP. Dunne, T., J. Agee, S. Beissinger, W.E. Dietrich, D. Gray, M.E. Power, V.H. Resh, and K. Rodrigues. 2001. A scientific basis for the prediction of cumulative watershed effects. 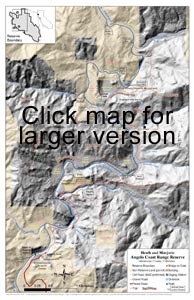 University of California Wildland Resource Center Report No. 46. 103 pp. Feminella, J.W., M.E. Power, and V.H. Resh. 1989. Periphyton responses to grazing invertebrates and riparian canopy in three Northern California coastal streams. Freshw. Biol. 22:445-487. Finlay, J.C., M.E. Power and G. Cabana. 1999. Effects of carbon limitation on algal carbon isotope ratios: implications for river food webs. Limnology and Oceanography 44:1198-1203. Finlay, J.C. 2003. Controls of streamwater dissolved inorganic carbon dynamics in a forested watershed. Biogeochemistry 62: 231-252. Ford, L.D. and K.S. Norris (1988). "The University of California Natural Reserve System." BioScience 38: 463-470. Gresens, S.E. 1997. Interactive effects of diet and thermal regime on growth of the midge Pseudochironomus richardsoni Malloch. Freshwater Biology 38: 365-373. Hill,W.R. and Knight A.W. 1987. Experimental analysis of the grazing interaction between a mayfly and stream algae. Ecology 68: 1955-1965. Howard, J.K. and K.M. Cuffey. 2003. Freshwater mussels in a California North Coast Range river: occurrence, distribution, and controls. J. North Am. Benthol. Soc. 22: 63-77. Hunter John C. 1997. Correspondence of environmental tolerances with leaf and branch attributes for six co -occurring species of broadly evergreen trees in northern California. Trees 11: 69 -175. Hunter John C. 1997. Fourteen years of change in two old-growth Pseudotsuga-Lithocarpus forests in northern California. Journal of the Torrey Botanical Society 124: 273 - 279. Hunter, J.C. and Michael G. Barbour. 2001. Through-growth by Pseudotsuga menziesii: A mechanism for change in forest composition without canopy gaps. J. Vegatation Science 12: 445-452. Hunter, JC, Parker, VT, and Barbour MG. 1999 Understory light and gap dynamics in an old growth forested watershed in coastal CAlifornia. Madrona 46, 1-6. Johnson, P.T., K.B. Lunde, E.G. Ritchie, and A.E. Launer. 1999. The effect of trematode infection on amphibian limb development and survivorship. Science 284: 802-804. Kotanen, P.M. 1994. Revegetation of meadows disturbed by feral pigs (Sus scrofa L.) in Mendocino County, California. Ph.D. dissertation, U. California, Berkeley. Kotanen, P.M. 1995. Responses of vegetation to a changing regime of disturbance: effects of feral pigs on a Californian Coastal Prairie. Ecography 18: 190-199. Kotanen, P.M. 1997b. Effects of experimental soil disturbance on revegetation by natives and exotics in coastal Californian meadows. J. Appl. Ecol. 34: 631-644. Kupferberg, S.J., J.C. Marks and M.E. Power. 1994. Effects of variation in natural algal and detrital diets on larval anuran (Hyla regilla) life history traits. Copeia 1994 (2): 446-457. Kupferberg, S.J. 1994. Exotic larval bullfrogs (Rana catesbeiana) as prey for native garter snakes: functional and conservation implications. Herpetological Review 25: 95-97. Kupferberg, S.J. 1996. Hydrologic and geomorphic factors affecting conservation of a river-breeding frog (Rana boylii). Ecological Applications 6: 1332-1344. Kupferberg, S. 1997a. Facilitationof periphyton production by tadpole grazing: functional differences between species. Freshwater Biology 37: 427-439. Kupferberg, S.J. 1997b. Bullfrog (Rana catesbeiana) invasion of a California river: the role of larval competition. Ecology 78: 1736-1751. Levine, J.M. 1999. Indirect facilitation: evidence and predictions from a riparian community. Ecology 80: 1762-1769. Levine, J.M. and C.M. D'Antonio. 1999. Elton revisited: a review of evidence linking diversity and invasibility. Oikos 87: 15-26. Levine, J.M. 2000. Species diversity and biological invasions: relating local process to community pattern. Science 288: 761-763. Levine, J.M. in review. A patch modeling approach to the population and community-level consequences of directional dispersal. submitted, Am. Nat. Levine, J.M. 2001. Ecological determinants and consequences of plant species diversity along a California stream. Ph.D. Dissertation, U. California, Berkeley. Marks, J.C. 1995. Ecology and genetics of freshwater algae. Ph.D. dissertation, U. California, Berkeley. Marks, J.C., M.E. Power and M.S. Parker. 2000. "Flood disturbance, algal productivity, and interannual variation in food chain length". Oikos 90: 20-27. Marks, J.C. and M. Cummings. 1996. DNA sequence variation in the ribosomal internal transcribed spacer region of freshwater Cladophora species (Chlorophyta). J. Phycology 32: 1035-1042. Parker, M.S. and M.E. Power. 1997. Effect of stream flow regulation and absence of scouring floods on trophic transfer of biomass to fish in Northern California rivers. Technical Completion Report, University of California Water Resources Center UCAL-WRC-W-825. Parker, M.S., M.E Power, and J.T. Wootton. 2002. Effects of substrate composition, stream-bed stability, and sediment supply on survival and trophic role of a dominant stream grazer. Verh. Internat. Verein. Limnol. 28: 238-241. Persson, L., J. Bengtsson, B.A. Menge and M.E. Power. 1995. Productivity and the structure and regulation of communities. pp. 396-434 in G.A. Polis and K.O. Winemiller (eds.) Food Webs: Integration of Patterns and Dynamics. Chapman and Hall, N.Y.
Polis, G.A., M.E. Power and G. Huxel. 2004 Food webs and landscapes. University of Chicago Press, Chicago, IL. Power, M. E., W. E. Rainey, M. S. Parker, J. L. Sabo, A. Smyth, S. Khandwala, J. C. Finlay, F. C. McNeely, K. Marsee, and C. Anderson. 2004. River to watershed subsidies in an old-growth conifer forest. in G. A. Polis, M. E. Power, and G. Huxel, editors. Food webs and Landscapes. Univ. Chicago Press, Chicago. Power, M.E. 2001 Field biology, food web models, and management: Challenges of context and scale. Oikos, 94, 118-129. Power, M. E.and W. E. Dietrich. 2002. Food webs in river networks. Ecological Research 17:451-471. Power, M.E. 2002. Preface: Shigeru Nakano's fundamental contributions to our knowledge of trophic exchange between streams and watersheds. in Ecology of Stream and Forest - Monographs of Nakano Shigeru. Hokkaido University Press, Hokkaido, Japan (In Japanese). Power, M.E. 2001. Controls on food webs in gravel-bedded rivers: the importance of the gravel bed habitat to trophic dynamics. pp 405-422 in Mosley, M. P. (editor), Gravel-Bed Rivers V, New Zealand Hydrological Society, Wellington, New Zealand. Power, M.E. 2001. Prey exchange between a stream and its forested watershed elevate predator densities in both habitats. Proc. Natl. Acad. Sci. 98: 14-15. Power, M.E., and W.E. Rainey 2000. "River to watershed subsidies in an old-growth conifer forest". Forest Webs and Landscapes. G.A. Polis, M.E. Power and G. Huxel. Chicago, University of Chicago Press. Power, M.E., W.E. Dietrich, and K.O. Sullivan. 1998. Experiment, observation, and inference in river and watershed investigations. Pp. 113-132 In W.J. Resetarits and J. Bernardo, eds. Experimental Ecology: Issues and perspectives. Oxford Univ. Press, Oxford, UK. Power, M.E., S.J. Kupferberg, G.W. Minshall, M.C. Molles and M.S. Parker. 1997. Sustaining Western Aquatic Food Webs. pp. 45-61 inW.C. Minckley (ed.) Aquatic Ecosystems Symposium, Tempe AZ. Report to the Western Water Policy Review , a Presidential Advisory Commission. Power, M.E., W.E. Dietrich, and J.C. Finlay. 1996. Dams and downstream aquatic biodiversity: Potential food web consequences of hydrologic and geomorphic change. Environmental Management 20: 887-895. Power, M.E., D. Tilman, J. A. Estes, B.A. Menge, W.J. Bond, L.S. Mills, G. Daily, J.C. Castilla, J. Lubchenco, and R.T. Paine. 1996. Challenges in the quest for keystones. BioScience 46: 609-620. Power, M.E., M.S. Parker and J.T. Wootton. 1996. Disturbance and food chain length in rivers. pp. 286-297 in G.A. Polis and K.O. Winemiller (eds.) Food Webs: Integration of Patterns and Dynamics. Chapman and Hall, N.Y.
Power, M.E. 1995. Floods, food chains and ecosystem processes in rivers. pp. 52-60 in: C.L. Jones and J.H. Lawton (eds.) Linking Species and Ecosystems. Chapman and Hall, N.Y.
Power, M.E. and L. S. Mills. 1995. The Keystone Cops meet in Hilo. Trends in Evolution and Ecology 10: 182-184. Power, M. E. 1992. Habitat heterogeneity and the functional significance of fish in river food webs. Ecology 73: 1675-1688. Power, M. E. 1992. Top down and bottom up forces in food webs: do plants have primacy? Ecology 73: 733-746. Power, M. E., J. C. Marks and M. S. Parker. 1992. Variation in the vulnerability of prey to different predators: Community-level consequences. Ecology 73: 2218-2223. Power, M.E. 1992. Hydrologic and trophic controls of seasonal algal blooms in northern California rivers. Archivs fur Hydrobiologie 125: 385-410. Power, M.E. 1991. Shifts in the effects of tuft-weaving midges on filamentous green algae. Amer. Midl. Nat. 125:275-285. Power, M.E. 1990. Benthic turfs vs. floating mats of algae in river food webs. Oikos 58:67-79. Power, M. E. 1990. Effects of fish in river food webs. Science 250: 411-415. Sabo, J.L. 2000. River-watershed exchange: Effects of rivers on the population and community dynamics of riparian lizards (Sceloporus occidentalis). Ph.D. Dissertation, University of California, Berkeley. Sabo, J. L. 2003. Hot rocks: The effects of substrate texture on the clutch production of riparian lizards. Oecologia 136:329-335. Sabo, J. L. and M. Ku. In press. Failed predation by a racer (Coluber constrictor) on a gravid female lizard (Sceloporus occidentalis. Herp Review. Sabo, J.L. and M.E. Power. 2002a. Numerical response of riparian lizards to aquatic insects and the short-term consequences for alternate terrestrial prey. Ecology 83: 3023-3236. Sabo, J.L. and M.E. Power. 2002b. River-watershed exchange: Effects of riverine subsidies on riparian lizards and their terrestrial prey. Ecology 83: 1860-1869. Siedl, M.A. and W.E. Dietrich. 1992. The problem of channel erosion into bedrock. Catena Suppl. 23: 101-124. Sklar, L., and W. E. Dietrich. 1998. River longitudinal profiles and bedrock incision models: stream power and the influence of sediment supply. Geophysical Monograph 107:237-260. Strayer, D.S., M.E. Power, W.F. Fagan, S.T.A. Pickett and J. Belnap. 2003 A classification of ecological boundaries. BioScience (Special Section on Ecological Boundaries),BioScience 53:723-729. Teague,S.A. Knight A.W. and Teague B.N. 1985. Stream microhabitat selectivity, resource partitioning, and niche shifts in grazing caddisfly larvae. Hydrobiol. 128:3-12. Thompson, J.N., O. J. Reichman, P. J. Morin, G. A. Polis, M. E. Power, R. W. Sterner, C. A. Couch, L. Gough, R. Holt, D. U. Hooper, F. Keesing, C. R. Lovell, B. T. Milne, M. C. Molles, D. W. Roberts, and S. Y. Strauss. Frontiers of Ecology. BioScience, in press. Wiens, J.A., V. H.Dale, F. Davis, J. J.Ewel, M. L.Hunter,Jr., J. C.Ogden, M. E.Power, M. A.Shannon. 2001. Report of the External Science Review Committee. The Nature Conservancy. Wootton, J.T., M.S. Parker and M.E. Power. 1996. The effect of disturbance on river food webs. Science 273: 1558-1560. Two other areas with structures are located on the grounds of the reserve: the Angelo Homesite, an area retained as an inholding by the Angelo family and currently occupied by the Resident Manager, Peter Steel, a descendant of the Angelo’s, and his family; and the White House, an unoccupied building that is listed on the Federal Register of Historic Places. In 1998, the Angelo Coast Range Reserve, with the assistance of the NRS, applied for and gratefully received approximately $1.2 million dollars from the Richard and Rhoda Goldman Fund to build a “Center for Environmental Science.” Construction of the Environmental Science Center with a meeting room, simple laboratories, computer and collection rooms, an office, and a screened lathe house was completed in summer 2002. This structure addresses the need for laboratory, computer, and meeting space at the Reserve. On-site administrative activities and collections have moved from the Headquarters to the new center, and classes and research teams can be accommodated. In addition to lab and meeting spaces, a rudimentary canopy access facility was constructed along a river-to-ridge elevational gradient in the reserve. All structures in the Reserve are managed in a manner that minimizes environmental impacts. Only the headquarters complex is linked to the county electrical grid; all other occupied buildings are powered by solar energy and propane. Use of Reserve Application Management System for logging visitor information and research metadata. � Submit written summaries of their research questions and hypotheses, followed by observations and results while working at the Reserve. They will be asked to specify GPS coordinates of study sites. Permanent, but relatively inconspicuous markers (e.g. tree tags) to monument location of studies will be encouraged; these should be sufficiently annotated to identify the project, and located with GPS coordinates that are reported in each writeup. Reports should be submitted to Peter Steel within two months after each field season, on an annual basis. In the past, researchers at the Angelo Reserve have informally shared data with one other on relevant projects and have been asked to supply reports or reprints on completed projects. With support from NCED, computing capabilities at Angelo have been upgraded to provide satellite web connectivity, and more efficient data file sharing over the Internet is now possible. Together with networked desktops in the new Environmental Center, and advice from experts assembled for workshops, upgraded computing facilities would facilitate Angelo’s integration into the OBFS framework or one like it . We will work towards developing a data archiving and sharing plan that is fair to individual researchers while increasing the probabilities that over the longer term, the data will be used as effectively as possible for advancing science and our bases for informed environmental decision-making. CBC funding for workshops, taxonomic forays, etc.